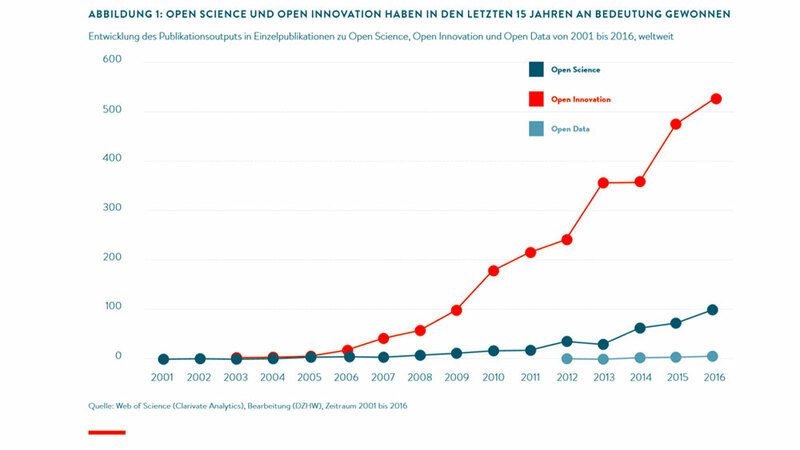 A new study by The Stifterverband explores the topics of Open Innovation and Open Science in Germany. It demonstrates that scientific discourse in these subjects has previously been largely disconnected. How could this disconnection be overcome? And what potential is there hidden away? The study “What do we gain through Open Science and Open Innovation? – The concept of strategic openness and its relevance to Germany” was published at the end of January 2019. It was developed as part of the Initiative for Open Science and Innovation by The Stifterverband, and was conducted in cooperation with the German Centre for Higher Education Research and Science Studies (DZHW), the Alexander von Humboldt Institute for Internet and Society and Winnovation Consulting. The study shows that Germany has a huge amount of catching up to do in comparison with other European countries and that strategically opening the German research and innovation system would lead to gains for society as a whole, as well as locational advantages. The authors shed light on how a strategic opening of science and innovation can be made successful. For this purpose, they have, for the first time, developed a model for strategic openness. The study is divided into two key parts. The first part focuses on the potential of strategic openness and the second part focuses on the political framework. The second part of the study examines the situation at European level, as well as in three selected countries (Austria, the United Kingdom and the Netherlands). These countries are compared to the situation in Germany. At the end, four recommended actions for Germany are provided. The first part of the report includes a bibliometric study. This shows how the fields of Open Science and Open Innovation have become much more prevalent in scientific literature and have grown in importance. Open Innovation has a significantly higher publication output than Open Science. At the same time, it shows that the related scientific discourses are systematically disconnected, although there are clear parallels between the two, such as the inclusion of external factors. This indicates that both areas are poorly connected with each other from a conceptual point of view. The bibliometric study shows how Open Science and Open Innovation can be brought together. In order to structure the different aspects of Open Science and Open Innovation, the study proposes a new concept of strategic openness. Three dimensions create a cohesive framework for Open Science and Open Innovation: firstly, “inclusivity and cooperation”; secondly, “accessibility and continued use”; thirdly, “transparency and review”. The “inclusivity and cooperation” dimension means a fundamental willingness to be open in terms of innovation and to involve new actors, such as people working in other roles, sectors or regions. This is expected to have positive effects, such as increasing the level of innovation, accelerating knowledge production, increasing problem-solving capacity and intensifying knowledge-sharing. The second dimension of the model is “accessibility and continued use”, which refers to the disclosure of knowledge that was previously only limited in terms of access (such as data) with the goal of contributing to an increase in economic and scientific efficiency, as it becomes (more easily) useable in this way. Another positive aspect is the increased visibility of the actors involved, which can also contribute to overcoming scepticism about science in civil society. The third dimension, “transparency and review”, focuses on how knowledge was created. Shedding light on the process of knowledge creation makes knowledge more open to scrutiny and increases verifiability for those who are not involved. This contributes to the increased credibility of the actors and the knowledge they generate. When we look at the situation in Germany on the basis of these three dimensions set out in the study, an ambivalent picture is painted. Germany has a far more differentiated research and innovation system. In addition, new actors and networks in the field of digital research and innovation policy that promote development have emerged (for example, the German Council for Scientific Information Infrastructures (RfII), the German Data Forum (RatSWD), Germany´s digital association bitkom or the Leibniz Research Alliance Science 2.0). In terms of Open Access to science in particular, much progress has been made in terms of the accessibility dimension. On the other hand, cooperation between different research fields in Germany has become increasingly uncommon. The cause of this can be found in the divisions that are present in the research system. This causes a marked institutional separation into foundational and applied research, as well as product development, and leads to the whole system missing out on important value-added potential. Open Science and Open Innovation could also help here. Further structural problems prevent the dissemination, and thus exploitation, of this potential in Germany. Here we have to look at the insufficient and somewhat stagnating trend of cooperation between science and industry, as well as the lack of willingness to integrate uncommon knowledge providers, even though these provide an opportunity to create new solutions and insights that take social values and benefits into account to a greater extent. The small number of cooperating SMEs shows that an important group is not involved in the innovation process, one which could benefit the most from targeted strategies that seek to increase openness. However, this is hardly surprising, since one of the main issues with funding policy is that funding programmes are aimed in particular at increasing the competitiveness of industry and large businesses. Service sectors and new, digitally supported methods designed to encourage Open Innovation receive much less systematic support. As the study shows, disseminating and promoting Open Science and Innovation strategies is an important political and social field of action. Germany does not currently play a leading role in this internationally and should therefore take targeted measures to strengthen its research and innovation system by opening-up and further developing funding programmes that promote greater use of the potential of Open Science and Innovation practices. Developing a national political framework for strategic openness: business, the scientific field and society should work together to define potentials and fields of action in this strategy development process. Extending the national research and innovation monitoring system: thus allowing the effects of open research to be monitored more closely. Involving uncommon actors in research and innovation projects: in particular, this relates to the gateways between business and science. In addition, the integration of user organisations or representatives in panels that assess scientific programmes and projects is interesting for validating the relevance of research projects at an early stage. Further developing transfer structures to cooperation centres: There should not only be a transfer of scientific findings to the economy and society, but this should also happen the other way round, with new research questions being transferred to the scientific community. Scientific institutions are called upon to further develop their absorption capacity for external knowledge and to build Open Innovation skills in order to be able to develop into very significant Open Innovation hubs and play a key role in the innovation ecosystem despite massive competition from new actors in the field of knowledge creation.